This week we look at tips and hacks for working at home as well as ideas for trying out a standing workstation. All part of our plan to help you battle the “Slump Monster”. BaM Choreography, LLC is a team of two sisters, Brianna Pato and Meghan Greenwood, who are based out of Pittsburgh, PA. BaM strives to provide high quality dance routines and energizing fitness classes in multiple styles for a variety of venues, including but not limited to: Competition Teams, Schools, Gyms, Studios, Family Centers, Theater Performances, Events, Music Videos, Weekend Workshops, Weddings, Workplace Fitness, etc. BaM offers professional services and motivational fitness – promoting health & confidence through dance for all ages! Check us out each week for 3 tips or hacks, as well as a new podcast interview. Carla Likar is the Aquatics Director at the Oxford Athletic Club in Wexford, PA. Carla started swimming competitively at the age of 5 and continued competing through college at Lock Haven University. November 2016 marks Oxford Athletic Club’s 18th anniversary; Carla was hired by the club 6 months after it opened. Carla was raised in Irwin, PA and started out swimming for the Norwin Aqua Club, where she has now returned as a coach. FitLabPGH is now active on YouTube. Check us out every MWF morning for a short fitness tip or lifestyle hack at our YouTube channel . Three times a week we’ll have a tip or hack to help you keep moving, part of making your life complete. 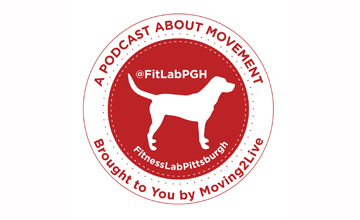 Whether you are an experienced mover, or want to start making movement a priority make FitLabPGH’s weekly podcast interviews AND new YouTube channel a part of your movement and healthy lifestyle toolbox. Remember- keep on moving!